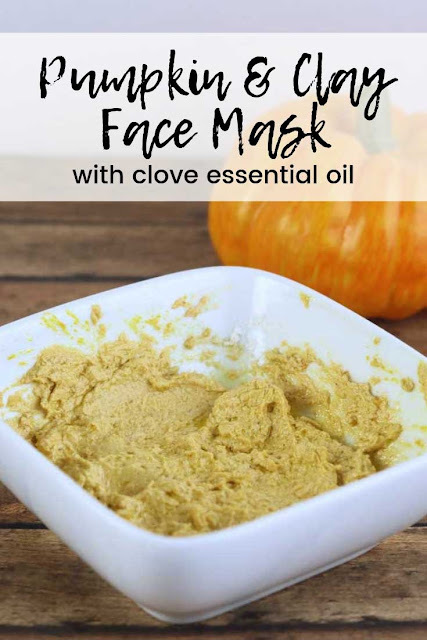 Exfoliate your skin and naturally moisturize with this DIY pumpkin and kaolin clay natural face mask recipe. If you've been reading my posts the last three weeks, then you know that we are all about pumpkins this month. Don't worry, I'm switching to apples soon! 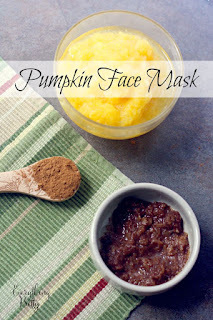 I've been making this pumpkin and kaolin clay face mask recipe for years, but I haven't blogged it before now. I like it because it's so easy to make, yet it's quite a powerful face mask. This mask has just four ingredients and takes about 2 minutes to make, but don't let that fool you. It's full of ingredients that help exfoliate your skin, moisturize, and help reduce acne. I don't have acne prone skin, but I do have large pores and oily skin. This natural face mask recipe works well at clearing out pores and balancing oil production. I wouldn't recommend this mask if you have sensitive skin because the pumpkin might irritate your skin. It should be good for normal skin though. Don't forget to make your skinny pumpkin spice latte before you make this pumpkin and clay face mask. Pumpkin isn't just an ingredient in a popular coffee drink; it's also an amazing natural skin care ingredient. Pumpkin is my favorite food ingredient for face masks because pumpkin masks are like getting an expensive peel and facial at a salon. Pumpkin is full of enzymes and alpha hydroxy acids. They work to increase cellular turnover, which means smoother and brighter looking skin. If your skin looks dull, pumpkin can really help. Pumpkin is high in vitamins A and C. Take a look at expensive skin care products. They have these vitamins in them. Have you priced a bottle of vitamin C for your skin lately? It's not cheap. Pumpkin is relatively cheap, and it really helps your skin by preventing signs of aging. Vitamins A and C are both important for boosting collagen production. This means your fine lines look better, and your skin looks softer. Pumpkin has essential fatty acids to moisturize your skin. It also has vitamin E, which is a powerful antioxidant. The molecules in pumpkin are small, so it penetrates deep into your skin. I've made this mask with both bentonite clay and kaolin clay , and I prefer kaolin. Bentonite makes a great mask, but I prefer to use it by itself. I used kaolin because it's gentler than bentonite clay. Kaolin is a lighter clay, but it still helps absorb excess oils and sebum on your skin. The pumpkin is busy sloughing of dead skin cells, and the kaolin clay works to pull dirt and other impurities from your pores for clearer looking skin. This also helps reduce the appearance of your pores. Kaolin is good for sensitive skin. My face gets really red when I use bentonite or pumpkin. Using them together is a powerful mask that leaves me red for hours. Kaolin doesn't cause redness, so it's better suited with the pumpkin I think. Hemp seed oil is wonderful for most types of skin. It's especially good for oily skin because it doesn't clog pores. It helps balance your natural oil production and nourishes skin without making it oily. It's high in essential fatty acids, including gamma-linolenic acid. This acts as an anti-inflammatory while it also stimulates cellular turnover and new cell production. Hemp seed oil also has linoleic acid and oleic acids that your body can't produce but needs for your skin's health. Normally, I'd use cinnamon essential oil in a pumpkin face mask recipe, but this time I used clove essential oil . Cinnamon essential oil is great for oily skin or acne prone skin, but it can irritate your skin. Clove essential oil is naturally anti-bacterial, and it can kill the bacteria that causes acne. It also fights candida, which can also cause blemishes. Mix the organic pumpkin and kaolin clay together in a small bowl. Add the hemp seed oil and clove essential oil. Stir well. Use your fingers to spread on your clean face. Let sit for 10 to 15 minutes. Rinse well. Follow with your favorite moisturizer. Use once a week to exfoliate your skin. I alternate an exfoliating clay mask with a scrub each week. I use the clay mask on the weekend, and I use a microdermabrasion mask mid-week. Lately, I've been using Derma-e Microdermabrasion Scrub with great results.